The unique solution for independent access to your swimming pool. The Poollift Perth specialists team have the knowledge in all mobility equipment to suit your individual requirements. 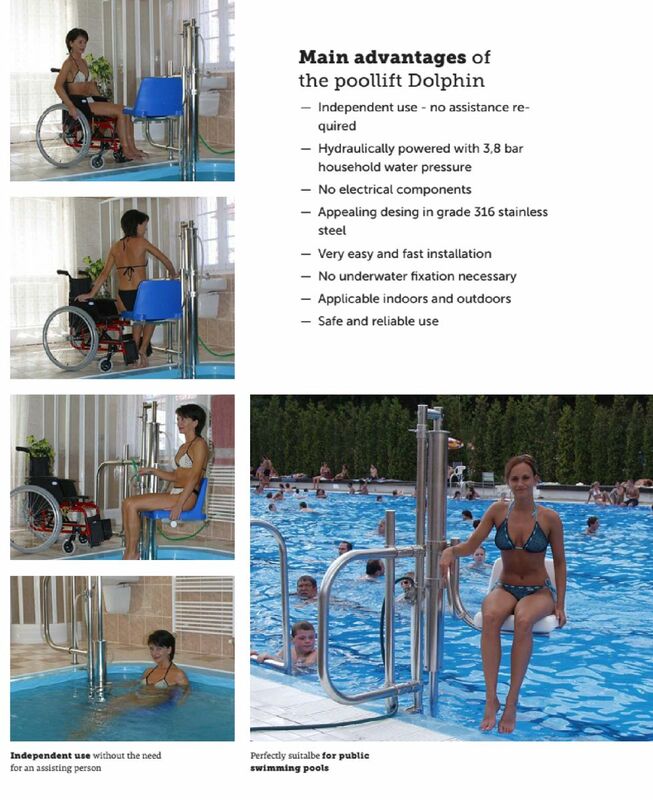 The poollift Dolphin is a valuable aid to get you in or out of a swimming pool without the need for any assisting person. No underwater installation is necessary. The lift is only fixed 1 time at on the upper level. Without the need for any electrical installation or battery use, the poollift runs on 3,8 bar household water pressure only! Operating levers at the upper as well as at the lower level allow a simple operation of the unit. The height adjustable seat turns automatically 90° when lowering or rising. This poollift is very easy to install (and also to demount for storage matters) and is made from high grade (316S) stainless steel!